Sky is my own personal cat, though I have been around the Siamese breed my whole life. My mother had one as well. Sky will be two years old in May. This picture is of her when she was younger; she is darker now of course. The first night she came home to us, Mom said, 'She wouldn't stay still or stop talking until she was with you.' It made me laugh because that first night when we brought her home, Mom wanted to take her to her room, to try make Sky her cat. But Sky cried out loudly until I went to my mother's room and called. Sky followed me out, and she has followed me ever since. The first night, she also followed our two other cats (the female is to turn seven this April, the male will turn seven in September). The most the two of them did was hiss. The female bonded with Sky over time, those two are always playing. The male doesn't care for her, but they sleep beside each other. The first night we got her, I slept in the living room because I had a hamster at the time, and the other two cats liked to try and get the hamster. I kept the door closed. The third night Sky was home I went into my room. I left the door open for Sky, and it took me a long time to fall asleep as I was worried the other two would get the hamster. But Sky would hiss whenever the other two tried to walk into my room, to keep them both out. The other two are always knocking down chairs. Sky also loves carrying things out of our rooms to the living room so we never know what we will come home to! Whisker was a Siamese/Himalayan mix we got from my aunt; her mother was a Siamese and her father was a Himalayan. My aunt owned her mother and my grandmother owned the father and they both lived in the house. She and I grew up together, both of us born the same year, maybe a month apart. She never drank out of the water dish we left for her, the only way she drank water is if we left the sink tap on, or she drank out of our own cups. She even drank milk out of our cups if we were not careful! Even if she was with me, as soon as she could hear my mother's car come into the parking lot she ran to the door to wait for her. I never had to look out the window; I always knew when mom was home because Whisker would run to the front door and wait for her. She was fourteen years old when we had to put her down, she had a tumor in her stomach. The first time she got one we had it removed, and tests came back normal, but a few months later it grew back and she started having trouble purring normally. We put her to sleep on November 2, 2005. A week later we got Stoli from a local shelter. She was seven months old, a gray and white female. She turned seven years old in April. Before we got Becardi, the black and white cat, she used to have leaving issues, or so we thought, because whenever we left her alone she ripped paper. We would come home and anything that was paper-ish would be all over the house – with what looked like cat marks, and it wasn't like that when we left! One day in summer before my freshman year in high school, I had to ask for another list for my summer reading because Stoli had one of her left-alone fits and she shredded my summer reading lists and the info I needed! No lie! That all ended as soon as we got Becardi the black cat. Becardi was born wild. He doesn't like people, he's so scared of them we still can't touch him. He'll be seven in September. We kept him in the bathroom to begin with because he was so scared of people he peed himself. He still has that issue when we have to move or take a trip to the vets, but he bonded to Stoli through the door while he was in the bathroom, and after a while we let him explore the house. He does love to beg for table scraps. We don't give them food but he still begs anyway, at least for the meat. I caught him once steal meat off my plate one day, with me right there. That was shortly after we got Sky and after Sky stole pasta off my plate the first night she was home. Every day I find him lying on a place on my bed where I would sleep with him, lying in the same position when I'm not there. Siamese cats are known to be very protective of their owners. They're also known to be lively and playful, and also for moving things around! 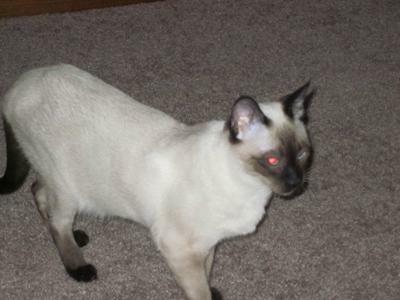 So Sky sounds very typical of the Siamese breed and she's a very beautiful example of one. And I enjoyed hearing about all your other cats, too. What an adorable story. I'm glad to hear your Siamese gets along with others. I just got a kitten who I'm pretty sure is Siamese and I was worried he wouldn't get along with my other two cats who aren't Siamese. Thanks for the cute story! Thank you, everyone that we know that sees her, loves her markings. Many people want to pet her but I'm the only one that can pick her up, anyone else tries to do that she tries to get out of their arms where if she's in mine she won't fight, she waits till I put her down. Oh never thought of that - maybe she did want to save the hamster for her own meal! Though when she hiss she was always with me, I took it she was trying to protect me from the other two cats. As marking me as I'm hers and not theirs! Ahahaha.